A hands-on approach to clear vinyl care. Clean, restore, and protect your vehicle or boat’s vinyl windows by hand. The DIamondite Clear Vinyl Kit for Hand Application includes the same state-of-the-art vinyl treatment products paired with our unique applicators that are safe and non-marring on clear vinyl surfaces. You will achieve the best results with this kit with early treatment. Soft, clear vinyl can start to yellow and dry out in a matter of months. 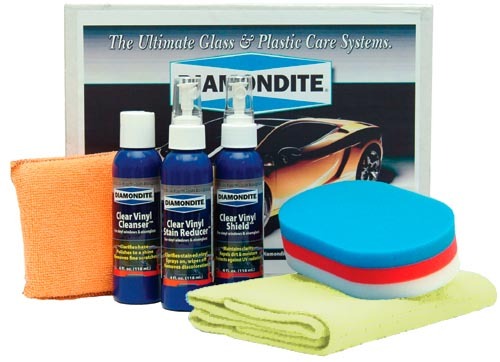 Use the Diamondite Clear Vinyl Kit for Hand Application at the first sign of damage to restore optical clarity and protect the vinyl from future damage. Diamondite Clear Vinyl Stain Reducer removes stains and yellowing to restore the clear, clean shine of soft vinyl windows. Just spray it on and watch discoloration vanish. There’s no faster, easier way to restore the like-new appearance of soft, clear vinyl windows on convertible tops and soft-top Jeeps. The solvent in Clear Vinyl Stain Reducer starts removing the yellow film and stains on contact. The cleaner is completely safe on the vinyl and does not strip the remaining plasticizers. Dingy, yellow vinyl windows will clear up in seconds! Our chemist took the basic principle of a fine paint cleanser and built a formula that is exceedingly safe on soft vinyl. The cleansing lotion cleans without stripping the plasticizers and softening agents that keep the vinyl supple. Diamondite Clear Vinyl Cleanser works well to remove haze from marine eisenglass, too. Even haze caused by salt spray can be removed in many cases, or at least greatly improved. Oil-based products tend to streak clear vinyl. Diamondite Clear Vinyl Shield is water-based to create a perfectly transparent, protective barrier between the vinyl and the environment. This is a crucial part of maintaining the vinyl because any factory top coat has already diminished. Tape off the area surrounding the vinyl using painter’s tape. Clean off any loose debris with a damp microfiber towel. Spray the vinyl window generously with Diamondite Clear Vinyl Stain Remover. Wait 10 seconds for the cleaner to penetrate. Wipe the window dry with a soft microfiber towel. If some stains or yellowing are still present, perform a second application. Dispense a quarter size amount of Diamondite Clear Vinyl Cleanser onto the white side of the Tri-color Foam Applicator. The white foam is polishing foam. Rub back and forth across the vinyl until the cleanser starts to dry. Buff with the included microfiber towel. If haze persists, repeat this step. Vinyl weathering occurs on the outside only so there is no need to polish the inside of the window. Mist the window with Diamondite Clear Vinyl Shield. Use a microfiber towel or applicator to spread the sealant over the vinyl. Flip and buff dry. After an hour, you can apply another coat for added protection.